Jordan Lyles won't have to go far to meet his new team and won't have to wait long to see his old one. The San Diego Padres right-hander was claimed off waivers by Milwaukee on Sunday while facing the Chicago Cubs at Wrigley Field. He could be added to the Brewers' active roster as early as Tuesday when the teams open a three-game set at Miller Park. 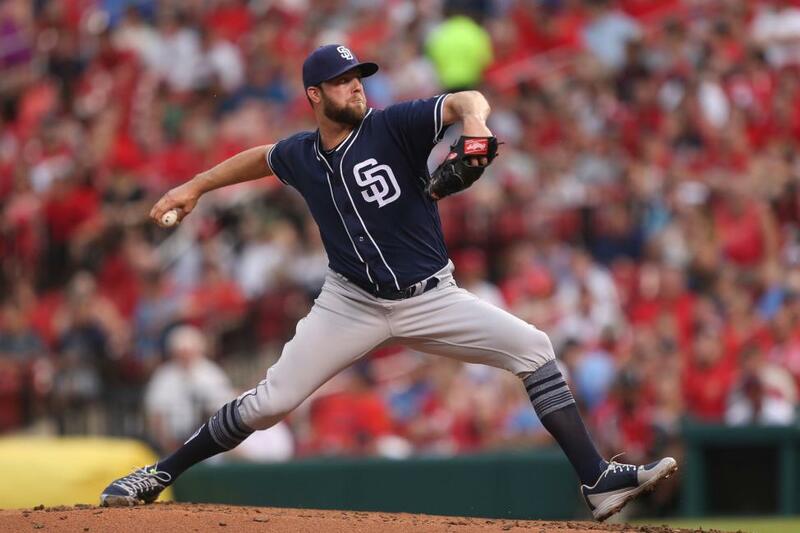 Lyles, 27, had a 4.29 ERA in 24 appearances for the Padres this season but was significantly more effective as a reliever. He posted a 3.33 ERA in 24 1/3 innings out of San Diego's bullpen and is expected to serve in a similar capacity with Milwaukee. "We like what he's done out of the bullpen," said Brewers general manager David Stearns, who was an assistant GM with the Houston Astros when Lyles was a top prospect in their system. "His velocity has ticked up out of the bullpen, he's changed the usage of his secondary stuff a little bit in a way we think has had some positive results. [post_ads]"We're excited to get him here and get him going. We think he's going to be a valuable member of this team going forward." The Brewers' bullpen has been one of the best in baseball all season and was fifth in the National League with a 3.60 ERA, a number that took a hit during the last few days as both Taylor Williams and Matt Albers were hit hard. "He's gotta make pitches. It's as simple as that," Brewers manager Craig Counsell said. "His velocity has been good. When a guy is missing around the plate, they get hit. A lot of times, it comes down to a little bit better execution. "He's throwing strikes, he's getting ahead in the count ... with two strikes, he's struggling to put away guys." Despite dropping an 11-inning heartbreaker Sunday to the Colorado Rockies, Milwaukee went into its off-day on a high note. The Brewers, who fell out of the National League Central's top spot with a six-game slide into the All-Star break, have won 10 of 17 to start the second half and are 3-0-1 in their last four series. That stretch left them a game back of the Cubs in the division race and 1 1/2 games ahead of the Braves for the National League's top wild-card spot. "I feel good about how we've started the second half," Counsell said Sunday after the Brewers missed out on a sweep of the Rockies with an 5-4 loss in 11 innings. "We've played 17 in a row against teams with winning records and we've come out of it in a good place." He'll be matched up Tuesday against the Padres' Opening Day starter, left-hander Clayton Richard. Richard only allowed a run in seven innings of that game but is looking to get back on track after going 0-3 with a 7.50 ERA in five July starts. "We have to understand what we did wrong," Richard said. "We also have to move away from it, move more toward the direction we want to be going and that's winning baseball games and doing the things it takes to win baseball games.